Bijou - A gem of a little salon in Skaneateles: Pumpkin Spice pedicures and Sugar plum toes! Pumpkin Spice pedicures and Sugar plum toes! Our new holiday scrubs came and we have been using them for a couple of weeks now, of course, I am still way behind on my sharing! It's actually good, (see I always say, everything happens for a reason) because clients have been able to give us feedback about them...do you want to hear what they say?? I betcha you do! 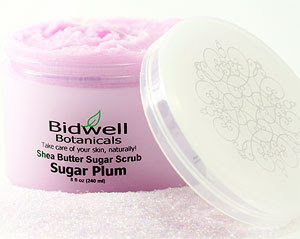 We've heard..."It smells like Thanksgiving"...."I feel like you are smearing a pumpkin pie on my legs, mmmm"...."Sugar plums are dancing on my toes"...and "OOOhhh my legs are sparkling sugar plums"!...We've heard so many things, the bottom line is, everyone is very pleased with the Bidwell products. And we love them too! 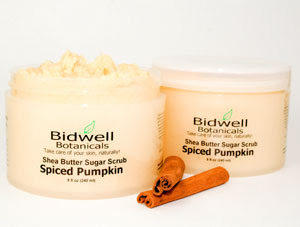 Sugar and spice, and everything nice; that's what Spiced Pumpkin Scrub is made of! Warming essential oils and soothing shea butter combine with the natural enzymes of pumpkin pulp and exfoliating cane sugar help to smooth and refine skin texture, all wrapped up in the delicious aroma of homemade pumpkin pie. New for Holiday 2009! Pure cane sugar and moisturizing shea butter buff away rough skin while soothing plum kernel oil and sugar cane extract hydrate and renew. Deliciously fruity with a touch of sugar and spice will make this sparkling holiday fragrance one of your favorites. At Bijou you can expect to get the best pedicure and the most relaxing, come with a friend and pamper yourself!